China’s urban residents (or the new “middle class”) protest on the streets only very rarely. Discontent is expressed almost exclusively online, via angry typing. But this has changed over the last five years – protests have come offline and onto the streets. 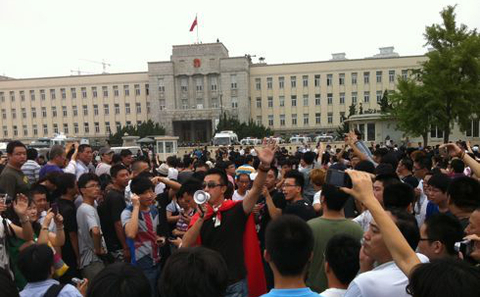 2012 saw popular protests in Ningbo, Shifang and Qidong. There have been widespread demonstrations over the last five years: against a PX plant in Dalian; against waste incinerators almost everywhere; against another PX plant in Xiamen, in the form of a mass “stroll”; against high speed rail in Shanghai, in the form of a mass “shop”; against the Liulitun incinerator in Beijing, when locals picketed the State Environmental Protection Agency. Chinese citizens are taking to the streets again and again, with a new protest arising as soon as the last is resolved. And the protests have escalated. Prior to 2012, both officials and the public showed restraint. But in 2012 the people clashed frequently with the government and the police, creating social disorder. According to Yang Zhaofei, vice-chair of the Chinese Society for Environmental Sciences, the number of environmental protests has increased by an average of 29% every year since 1996, while in 2011 the number of major environmental incidents rose 120%. Chinese Academy of Social Sciences researcher Shan Guangnai told the newspaper Southern Weekend that, “illegal land seizures and relocations, labour disputes and environmental pollution are the three factors driving popular protests." The harm and fear caused by pollution are the main factors driving unrest in Chinese cities. But the Chinese people have plenty to be angry about: corruption; the rich-poor gap; and more. So why is it only environmental issues which bring them to the streets? There are three reasons: first, pollution is already intolerable, and is a threat to life and health. A vastly richer factory owner living nearby can be accepted, but nobody could tolerate his factory making their children sick. Second, environmental rights are apolitical: protesting does not challenge the authority of the current system. Protestors need not fear being accused of opposing the government. Third, environmental issues have a wider impact than illegal land seizures and labour disputes. A large chemical plant could have an impact on one million people. When tens or hundreds of thousands are in agreement there is safety in numbers. But China has long suffered from pollution – why have these clashes only occurred recently? The main reason is the failure of environmental authorities. Environmental protection officials and some researchers delight in pointing out that the main causes of these cases of unrest are not actually environmental problems. For example, the proposed smelting plant which sparked protests in Shifang would actually have reduced pollution by replacing smaller and less advanced firms. But the bosses of those smaller firms, unhappy with their lot, encouraged the public to protest. In Ningbo the villagers were unhappy with levels of compensation for relocation, and used the “environmental” banner to bring urban residents out onto the streets. There is some truth to these views. Unrest is caused by conflict of interests, and conflicts of interests are not just confined to the environment. Environmental issues may just be a politically safe excuse for protest, and the Ministry of Environmental Protection cannot step in and make up for local government failings. “One, construction of projects without approval; two, the need for improvements in the environmental impact assessment process; three, problems with local government capabilities; and four, a lack of legislation and mechanisms for assessing the social impact of major projects.” Only the second of these is anything to do with the environmental authorities. But regardless, all of these protests took place under the banner of protecting the environment. If environmental matters were handled properly, there may still be small protests, but not these large incidents. There were also other interests involved in the 2007 PX protests in Xiamen, such as property developers and owners encouraging protests on environmental grounds in order to protect property prices. In this respect the 2007 PX protests and the demonstrations of 2012 are identical. But the course of the incidents was completely different. In Xiamen a resolution was reached reasonably peacefully, while in the 2012 things only calmed down after fierce clashes. Why? Because in Xiamen the environmental authorities intervened and prevented outright conflict. On the morning of June 7, 2007, as the citizens and government of Xiamen faced off, Pan Yue, deputy director of the State Environmental Protection Agency (later the Ministry of Environmental Protection) told the media that the agency would immediately carry out a city-wide environmental assessment. He expressed a hope that the Xiamen government would take that assessment into account and make adjustments to its existing plans and, as far as possible, separate the chemical industry and residential areas. The effect was immediate, and the project was cancelled before protests became violent. Although the environmental authorities do not have much power, they represent the central government stance on environmental matters. When the people and the government clash, local government tends to treat those defending their rights as unruly troublemakers to be supressed. But the environmental authorities, representing central government, cannot be ignored, and so conflict is avoided. The prompt appearance of the environmental authorities also maintains the authority and credibility of central government. In subsequent popular protests, and most obviously in the unrest of 2012, the ministry said and did nothing, apart from distancing itself from the incidents after the fact. Nor is this the only example of the ministry’s inaction. Over the last five years China’s environment has significantly worsened, yet the ministry has rarely acted. The public right to know and participate are key to resolving disputes and five years ago the ministry issued interim measures on public participation in the environmental impact assessment process and regulations on the release of environmental information, in order to protect these rights. If these were implemented, there would, in theory, be no protests over the environment. But for whatever reason, five years later these rules still exist only on paper. Five years ago, SEPA launched crackdown after crackdown on companies breaking the law, even the biggest power firms. It issued regional moratoriums on new projects, preventing local government from issuing new approvals until improvements were made. It halted an illegal project at the Old Summer Palace and held an unprecedented public hearing, providing an example for public participation and democratic decision making. And it started researching regional environmental impact assessments and the idea of a Green GDP (Gross Domestic Product) measurement, designed to halt China’s GDP worship. But the last five years have seen no similar actions. Even more bizarre, the ministry has relaxed environmental impact assessments, allowing large projects to go ahead easily nationwide, particularly in the ecologically fragile west of China. It is these large projects, carried out with no regard to the environmental or social impact, that are the cause of social unrest. China’s environmental authorities are weak, but environmental matters have a huge impact on health and social equality, and now also the chances of unrest. An environmental problem can throw a city into chaos and unsettle the nation. There may even be a possibility of more serious outcomes. China’s new leaders should take a broader view of environmental issues and their environmental authorities. Thanks Jianqiang, Reminds me of the 1960's in the US. Bang on. In the past 5 yeas, China talked about developing low-carbon green industry and building ecological civilisation in a broader sense. However, despite the fact that the Environmental protection body got a higher administrative level, its profile has gone lower and its action gone quieter. One can't help thinking whether it has something to do with Pan's position in the authority. The governing body has gone from outspoken to indecisive. I am inspired by the people of China in their efforts to deal with pollution NOW.